South Korean President Moon Jae-in on Thursday strongly urged Japan to sincerely reflect on its past wrongdoings, adding that the country has no right to claim that the issue of its sexual slavery of Korean women is "settled", despite the two countries' 2015 deal, which he called "flawed". "...In resolving the issue of sexual slaves, the Japanese government, the perpetrator, must not say it is 'over'," Moon said in a speech marking the anniversary of the March 1, 1919 Movement, in which tens of thousands of Koreans took to the streets to declare the country's independence from Japan's colonial rule.The ceremony was held at Seodaemun Prison, where Japan's colonial government held and persecuted nearly 100,000 Korean independence fighters during its 1910-45 colonial rule of Korea, Yonhap news agency reported.Moon's remarks came amid Tokyo's repeated calls for the new South Korean President and his administration to honour the 2015 agreement made with South Korea's ousted administration. Under the pact, the former Park Geun-hye administration agreed to "finally and irreversibly" settle the issue in exchange for 1 billion yen ($9 million).Moon earlier declared the controversial agreement "seriously flawed". "Inhumane violation of human rights during war cannot be covered by saying it is over," he said in the event marking the 99th anniversary of the March 1 movement. 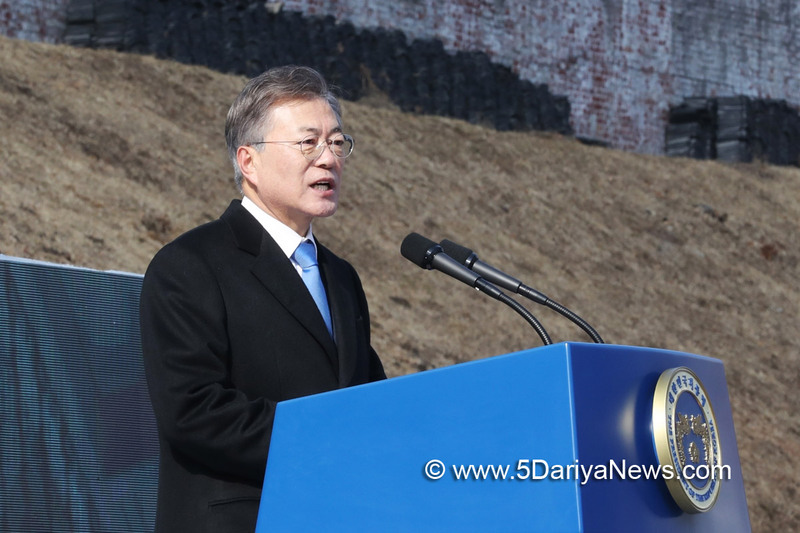 "A true resolution only comes from remembering history and learning from that history, especially when it is the history of an unfortunate past," the chief executive added.Moon said what his country and its victims wanted to see from Japan was a "sincere apology".Japan immediately expressed regret regarding Moon's remarks. Chief Cabinet Secretary Yoshihide Suga called the remarks "extremely regrettable" and that the country had immediately filed a complaint with the South through diplomatic channels, according to media reports.Moon then urged Japan to cease its territorial claim to South Korea's eastern-most island of Dokdo. "Dokdo is the land that was first occupied in the process of Japan's invasion of Korea. It is our native territory," the South Korean President stressed. "Japan denying this fact is the same as its refusal to reflect on its imperial invasion (of Korea)," he added.